Plenty of modern authors have taken their hand to mythology. Neil Gaiman and AS Byatt have both had a go at Norse Mythology and recently Margaret Atwood retold the story of Penelope. Now Booker Prize winning Irish novelist Colm Tóibín, possibly better known for more sedate novels such as the recent Brooklyn, takes a turn at some bloody Greek mythology. House of Names retells the story of Clytemnestra and her children Iphigenia, Electra and Orestes. Clytemnestra was the wife of Agamemnon, known for winning the Trojan wars. But it was not an easy start to his campaign, the gods prevented his ships from leaving and he was told that he would need to sacrifice his oldest daughter Iphigenia to appease them. Tricked into bringing Iphigenia to the camp to be married to Achilles, Clytemnestra has to watch as her daughter is taken for sacrifice. She spends the next years plotting her revenge against her husband, allying herself with the slippery Aegisthus to do so. But the killing of Agamemnon puts in motion another round of revenge and retribution when Orestes is taken captive and, on his return, plots with his sister Electra to kill their mother. Tóibín uses different narrative techniques for Clytemnestra, Electra and Orestes. While the former two are given a first person narrative and a deep view of their inner world, Orestes is kept at a remove through a third person narration. Here is a young man looking for a role model, looking for some approval, who does what he thinks is right, manipulated by those around him to do the dirty work and then wearing the responsibility for the results. The middle of the narrative is Tóibín filling in the story of Orestes, in which he goes away a boy and comes back a vengeful young man. Those familiar with this story will know that it is not one for the squeamish. From its opening lines from Clytemnestra: “I have been acquainted with the smell of death” as she stands over the two bodies that she has ordered be left in the sun “until the sweetness gave way to stench”. Tóibín effectively navigates the bloody character beats which involves plenty of death and destruction. For those currently bingeing on Game of Thrones it is instructive to go back to some of the source material for its mythology. There is the daughter sacrificed by her father to appease the gods, the children of a slain father biding their time for revenge, men killed by having their eyes squeezed out of their head… the list goes on. But House of Names has bigger fish to fry than fiction. Through the narrative, Tóibín brings to mind recent global conflicts and the cycles of violence and revenge that have engendered them. That toppling a tyrant might just lead to a different type of conflict that is even more violent than the last. And unlike the original texts, the gods do not shaping events, the ones responsible are entirely human. 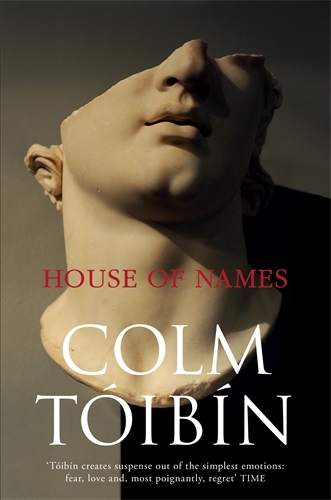 House of Names is written with Tóibín’s poetic flare. The text is measured but effectively carries the action, deeply drawn characters and the underlying philosophy of the tale. It demonstrates once again that while there may be no new stories, sometimes the storyteller can make all the difference.